So I’m sitting around waiting for a hurricane to hit. 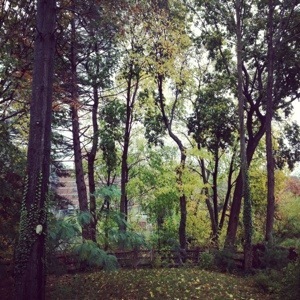 The trees outside my window are swaying, the sky is grey. I’ve got a pile of books to read but no groceries because I went out for ice cream sundaes with friends last night instead of scrounging for batteries and stocking up on non-perishables. Everyone is in deep speculation mode. How hard will this hit? How many will lose power? How long will we lose power? Will Halloween be cancelled? Will everyone be okay?? And as we sit and wait, no one knows the answers. No matter how much internet trolling I do, no matter how much Weather Channel I watch, no matter how many times I get out of bed to peak out of the window in the middle of the night; this is going to be what it’s going to be. Everyone’s got a storm style. There are folks who plan and prepare and take care of business. Folks who freak out and worry and worry and worry. Folks who think everyone else is crazy for even talking about the storm. Folks who get excited. Maybe our storm styles are a reflection of how we approach the unpredictability of life. I can’t control what Sandy will bring, so all I can do is be. I’m the calm through the storm. So on this blustery, weird day, I’m headed to where I feel safest and happiest during a storm: in my pjs hunkered down with a dear old friend.